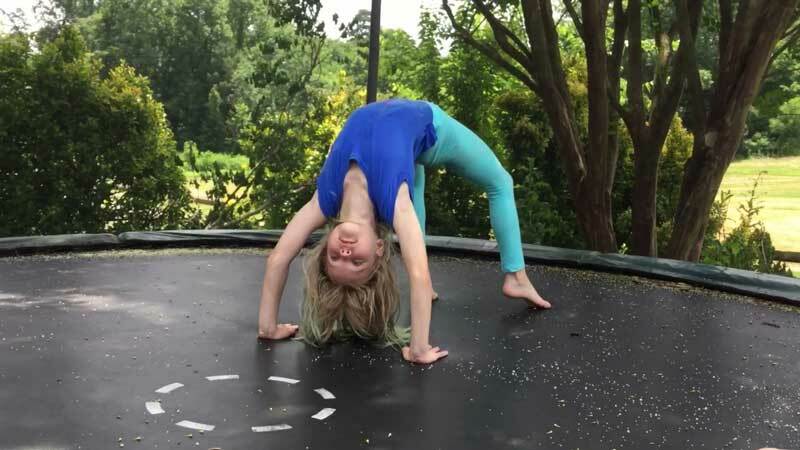 >> How To Do A Back Handspring on the Trampoline? The back handspring is one of the basic building blocks for a number of gymnasts as well as for the cheerleading routines. If you are interested in doing a back handspring, you should have a proper strength in your upper body, especially in the shoulders and arms. Before you can do a back handspring, you should try a backbend, a back walkover, and a handstand. Only after this, you should start practicing with a trampoline. During the back handspring, you have to jump backward and land on the hands and kick over your head. This is most commonly seen in gymnastics, but the other martial artists and athletes can also do it. One of the most critical elements of playing a back handspring is conquering your fear. Though it might look difficult in the beginning, with proper training and practice, you will be able to do it confidently and without any hassle. In order to get over your fear of a back handspring, the first thing that you have to do is learn to maintain a proper and appropriate form. The flips of gymnastics are known to have different variations, but in case of a back handspring, the form remains consistent. You have to bring the feet together while raising the hands up in the air. Next, you have to maintain a form, which depicts that you are trying to sit on a chair that is invisible. Then you have to jump backward and keep your hands close to your head. Ensure that your legs are together and you have to kick them over the head until you are back, standing. The trampoline tracks are buoyant, thereby allowing you to perform a back handspring without putting in much effort. Trampolines are found in almost all the backyards now, and you can also visit a gymnastic school or a recreational facility to practice a back handspring. When you use trampoline tracks, you can easily create the complex sequences, which require a complete concentration and commitment. The trampoline helps in amplifying the acrobatic skill of a tumbler or a gymnast. If you learn to do a backward handspring on a trampoline, you can refine your form and isolate all the problems that are present in your technique off back handspring. Step 1: Firstly, you have to stand on your trampoline and try to generate a tiny bounce. If you are using the trampoline alone, you should stand towards the edge of the apparatus instead of standing near the center. Keep bouncing until you can nullify the gravity. However, ensure that you do not leave the surface of the trampoline. There is no need to jump high up in the air. Step 2: After this, try to position yourself as if you are sitting on a stool. Soon as you approach the lowest point of the bounce, you have to bend the legs at an angle similar to 90° while keeping the back straight. Next, you have to fall back on the rear end when you can start feeling the momentum pulling you backward. Step 3: Stand up again and generate a similar bounce. Try to reposition yourself on your trampoline as you get a knowledge of how much you can bend backward. Get back into the similar sitting position and as you feel being pulled backward, throw your arms over the head into the air. Step 4: Jump backward to the handstand position by using up the momentum from the bounce as well as the motion of falling that had been generated by The invisible stool or chair. Try to keep a huge stance with the hands so that you can support your own weight. Step 5: You can imagine a ball that hovers over the head. Your duty is to try and kick the ball when you are in an upside down position. Ensure that your legs are close by so that you can whip them down to the surface of the trampoline while completing the entire rotation. Keep in mind that if you kick the ball fast, you will be able to bring back your legs down to the surface of the trampoline mat and support the body weight without any effort. Step 6: After this, you have to bring back your upper body to one-hundred and eighty degrees. Now you have to sweep the arms in front of your body and over the head so that you can nullify the remaining momentum. If you follow these steps, you can easily do a back handspring without any effort. Also, if you are new to do this, trying it with a trampoline is the best option. Even an experienced gymnast performs back handsprings on a trampoline so that they do not get hurt in any manner when they are performing it on the ground.